yellowwedge cheese | What's for tea tonight dear? Another risotto, but a traditionally made one this time – albeit with a less than traditional ingredient in the form of Paški Sir, of which more later. For a vegetarian version omit the lamb and use vegetable stock. Since my old friend Geoff first taught me to make a proper risotto in his tiny Battersea kitchen some twenty odd years ago I’ve always found it a really gratifying way to spend twenty odd minutes of my time. It does demand your 100% attention for a while but your efforts are repaid many-fold, and the constant, controlled stirring and the slow addition of stock have a meditative rhythm all of their own. 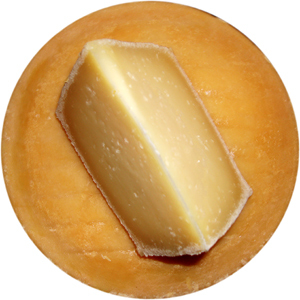 Paški Sir is a hard ewe’s milk cheese from Croatian island of Pag, and we think it’s quite a discovery. The cheese has the sweetness of sheep’s milk, hints of the herby meadows where the sheep graze, and gains further complexity by being rubbed with olive and ash before maturing. Last time I checked yellowwedge cheese was one of only two UK stockists but after its recent success at the World Cheese Awards [winning the Barber’s Trophy for Best New Cheese] I’m pretty sure that there will soon be plenty of others. Use a good flavourful stock for this dish, perhaps reduce one you already have until further intensified. I had a bulb of roasted garlic to hand and added this to my stock for its sweetness and depth of flavour. The leftover lamb is not essential, and if making a vegetarian version clearly you’ll want to leave it out, but I had some leftover shank from an earlier braise and the other ingredients – peas, garlic, mint for heaven’s sake – seemed to be crying out for it. And as I had hoped it worked well with the Paški Sir, but then ewe’s milk cheeses do have an almost incestuous affinity with lamb. If you don’t believe me trying following your next roast lamb dinner with a cheese board of Wigmore, Beenleigh Blue and Paški Sir [or Manchego if you can’t get hold of any]. If you are using it tear and / or chop the lamb into small slivers and nuggets. Be sure to do this and all the other prep before you start. The shopkeeper has a deep seated aversion to re-heated lamb [I have not been able to cook proper shepherd’s pie at home for over 15 years!] and there was much grumbling and muttering about potential take-aways during the preparation, but in the end the entire bowlful disappeared without complaint. It may even have been enjoyed. Melt the butter and add the onions, some salt and about a teaspoonful of the mint, the rest of which will be added towards the end. Sauté over a low to medium heat for 10 minutes until softened, adding the garlic for the last two minutes. Meanwhile heat the stock in another pan and hold at a barely trembling simmer. Add the rice to the softened onions, stir well to coat with the buttery juices and give it minute or two more. Turn up the heat under the risotto pan and add the vermouth. Stir constantly, around and in a figure of eight, exposing the hot base of the pan where the returning liquids will turn to steam and cook the rice. Once the liquid has all but disappeared add a ladleful of hot stock and repeat. Continue in this manner for around 15 minutes. Test a grain or two of rice between your teeth, it should be almost cooked with a bit of crunch still at the core. If not continue as above, testing after each ladleful of stock has been absorbed. Now add the lamb, and a ladle or two more of stock. 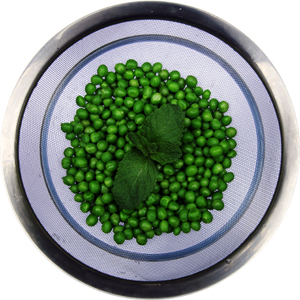 With the last addition of stock add the mint, parsley, peas, mint sauce and finely grated Paški Sir. The risotto is ready when the rice is just al dente and the consistency is creamy and moist, usually after around twenty minutes. If necessary add a final dose of stock, turn off the heat and allow to rest, covered with a clean tea towel. Check the seasoning, you’ll want plenty of black pepper, top with the rest of the Paški Sir, and serve.